Happy Halloween, even though market action over the past few weeks has been anything but scary. (It could have been; Friday October 29 was the 81st anniversary of the “Black Tuesday” crash of 1929). The Dow was up 3.06% during the month of October, for the best October since 2006. The S&P 500 was up an even better 3.69% for October, which was the S&P 500’s best October since 2003. As the chart shows (click to enlarge), one month ago gold was $1,310, and it closed October at a shade under $1,360, for a $50 or 3.8% gain on the month. It was a volatile month, with a peak over $1,380, and a low of less than $1,300 on the last day of last month. That’s a swing of over 6% in the month. 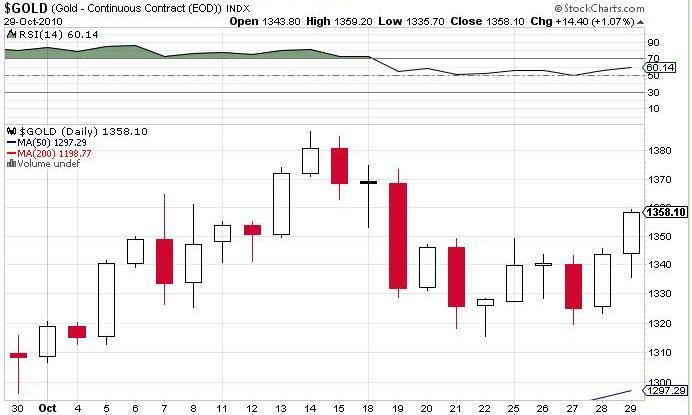 First, gold was up just over 3% on the month, and the general markets were up just over 3%. That’s interesting, because clearly in October gold was not a “hedge” against the market; it was the market. 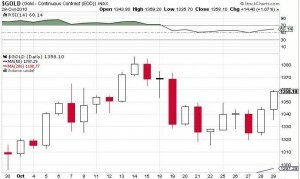 Will gold and the markets continue to move in the same direction, forever? I doubt it, but more on that later. Second, gold is volatile. Gold shares are volatile. In any given month you can pick up gold shares at the low end of the range, and you can sell them when they go up. 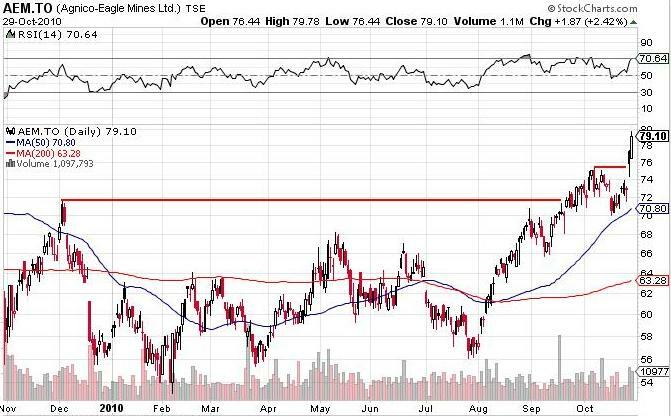 For example, on October 25 (last Monday) I picked up a few shares of AEM.TO – Agnico-Eagle Mines Ltd. for $73.07. They closed Friday at $79.10. That’s a nice run in one week. But will it last? I have no idea. 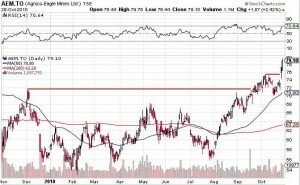 Obviously we have taken out the old high from two years ago at $72, and the high for October at just under $76. But the RSI is now back over 70, and with this stock it never stays there for long, so a short term pullback is likely. So, in that spirit, instead of selling my shares, I covered them, by selling some November call options. If the stock keeps running, I lose it, but so be it; I sold options at higher than I paid for the stock, and I pocket the premium. We’ve had a great run. The impact of massive government spending and artificially low interest rates have allowed the Big Boys to inflate the market. But unemployment is still high, real consumer spending is still low, so it appears to be an illusion. I continue to believe that the wake-up call will occur shortly after the U.S. midterm elections on November 2. The “get rid of the incumbent” mood of the electorate will become obvious on Tuesday night, with the Democrats losing many seats. We will wake up the next day to find President Obama preparing for his trip to India, so that he’s out of the country while we all digest the results of the election. (That’s a lot different than the victory tour he went on in the U.S. two years ago). With the constraints of the election behind them, the FOMC can announce after their November 3 meeting that they are doing more QE, or whatever. China can sell more dollars. More foreclosures can happen. Or whatever. My point is that there is a lot of stuff scheduled to happen next week. You don’t need to be a psychic to see into the future, and the near term future looks very volatile. My assumption is that next week is when we start to see the cracks, and we will most likely see a very significant market correction in November. That will bring down the price of everything, including stocks and gold. You may think that gold is a hedge against calamity, but as we saw in October, gold and the markets can move together, and that appears to be what’s happening at the moment. A stock market crash will temporarily depress gold share prices, and I expect that to be the perfect buying opportunity. So, I sit poised at my computer, ready to enter below market orders in the hopes of deploying my cash and getting filled if a correction occurs. If I’m wrong, I will continue to nibble, as I did this past week. Check back next week for more thoughts on the month of November, which I predict will be the most interesting month of the year. Thanks, and see you next week.